On my recent trip to Bologna, my friend Shobha (of Just Go Places) and I were fortunate enough to be hosted by Hotel Touring, which I reviewed in an earlier post. The hotel also arranged for us to eat one evening at a nearby restaurant, Osteria dè Poeti. This was particularly lucky because it is in a basement on a minor side street and we never would have found it otherwise. Osteria dè Poeti occupies the former wine cellar of a palazzo (noble’s palace) dating from the 1400’s. It became a “public-house” later, in the 1600’s, which explains the huge fireplace in the room where we ate. The vaulted brick ceilings of the underground rooms of Osteria dè Poeti give it a warm and cozy atmosphere, accentuated by the variety of homey objects hanging on the walls. I spotted photos and drawings, but also pots and pans and other cooking implements, an entire oaken door, and even a Victrola, of all things. At the bottom of the entrance stairway, a long hallway is lined with shelves full of wine bottles, as well as work counters, which I think serve as the restaurant’s bar. I saw two large dining rooms off of that first hall, though there could have been more. But never mind the atmosphere, what’s important is the food, and Osteria dè Poeti is excellent at preparing quality classic Bolognese cuisine. While we waited for our first course, we received what our very friendly waiter described as pizza. This was the only part of the meal that disappointed us: it tasted like plain pizza crust. Things got distinctly better from there. Our first course was a pumpkin tart—pumpkin turned up in several meals we ate in Bologna—with polenta and porcini mushroom sauce. It didn’t look very appetizing but turned out to be a lovely combination: the slight sweetness of the pumpkin offset by the smoky taste of the porcini sauce. Our main course, at our request, was a taste of two different pastas, so we could avoid having to choose. True Bolognese sauce is called ragu in Bologna, and it is not what we outsiders think of as Bolognese sauce. The main ingredient is beef, with only a very small amount of tomato, and it is always served on tagliatelli, not—most emphatically not—on spaghetti. It’s a quintessentially local dish, served topped with a bit of freshly-grated local parmesan, and it is wonderful. The second pasta we tried was a spinach and ricotta tortelloni with butter and sage sauce. Proper tortelloni (bigger) and tortellini (smaller), according to a friendly cab driver I met (also due to the people at Hotel Touring) are made by hand. The tortellini, because they’re smaller, are more expensive, but these tortelloni at Osteria dè Poeti were magnificent! The simple butter and sage sauce was a subtle addition to the tortelloni’s own perfect combination of spinach and ricotta, topped, again, with a sprinkling of Parmesan. I liked that dish so much I brought some handmade tortellini home and cooked it the first night back with my attempt at a butter and sage sauce. I know nothing about wine, but I’ll add that we were served Falanghina del Sannio with our meal. To my completely un-discerning palate, it complemented the meal very well. Despite cleaning our plates on each course so far, we just had to try two desserts: ice cake with amaretto and the classic tiramisu. Neither of them disappointed us. I’m not a big fan of almonds, so I preferred the tiramisu, but the ice cake was pretty special as well. I should also point out another local dish you can get at Osteria dè Poeti: risotto in a Parmesan cheese wheel. We learned later that a local chef invented this dish when a large amount of local Parmesan cheese failed to qualify to be fully aged. That didn’t make it unusable, but it had to be sold and used before it went bad, leading local chefs to experiment with new recipes involving Parmesan. To make this dish, the chef cooks risotto, then puts it into a whole wheel of parmesan cheese. The hot risotto makes the cheese soft, and it can then be scraped out and mixed with the risotto and served. I don’t know how many dishes of risotto can be produced from one of those enormous wheels of cheese, but it looked and smelled delicious! Disclosure: Despite the fact that the meal was complimentary, all opinions above are my own. Now that’s an authentic experience ….and really unique foods, like the risotto. Befpre I read the part about being the old kitchen I thought, “That’s awful! They cook right in the middle of the dining room!” (Thanks for clarifying about the fireplace). Love how the place is down below. It has a cave-like atmosphere. Often hotels know the best places to eat. Yes, and it seemed quite popular too. It had filled up by the time we left. Oh your description of that risotto has my mouth-watering. What a feast you had! I didn’t realize what it was till I saw it and smelled it being served to someone else, and by then we’d eaten already! Maybe next time! Wow. I want to be there. Your descriptions of (and distinctions between) the dishes are really helpful. 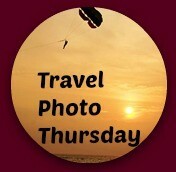 But mostly I’m intrigued by Hotel Touring! I certainly recommend both the hotel and the restaurant! And they’re very near each other so you can easily walk / waddle home after dinner! That was one great dinner! I loved the tortellini in sage and cream. Very subtle taste but so delicious! Definitely a great find. I may have to make it again. It wasn’t hard: just butter with some sage cooked in it. But it’s hard to find the proper tortellini or tortelloni here in the Netherlands… It was the combination that made it so good. I’m so glad I had dinner before reading your post, Rachel! The tortellini sounds great, and risotto prepared inside a Parmesan wheel…well that it something I would definitely like to try. Plus such atmosphere. On the list for my next time in Bologna. Yes, reading foodie blog posts is dangerous if you haven’t eaten! WOW that’s awesome! Those “unknown” places are the best – I’m glad the hotel was able to set this up for you. Places like this have so much tradition, culture and history – I would love to go one day. 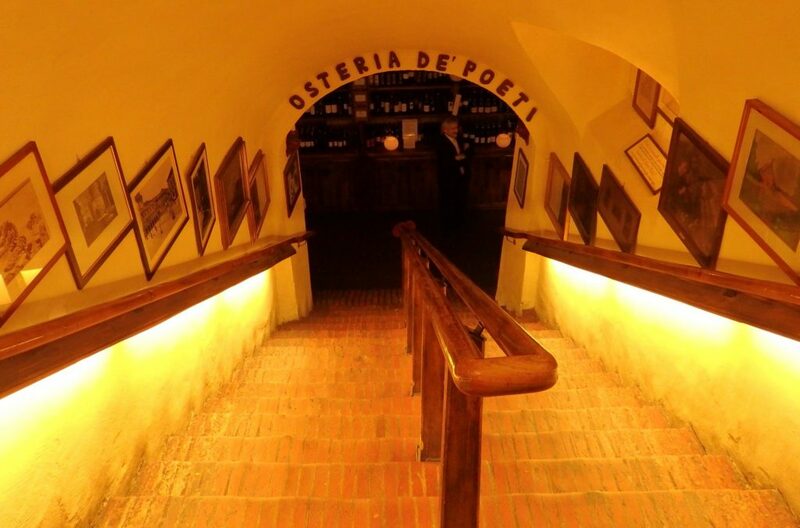 The vaulted ceilings of the underground restaurant at Osteria De Poeti make it look a really magical and unusual food destination. I think the visual surroundings are as important as the food itself when you’re dining out, but he food looked amazing too. They’re both wonderful! I never would have expected that a room with no windows could be so pleasant. Those places you’d never be able to find on your own are often the best, it seems. Except for the “pizza” at Osteria de Poeti, it all looks and sounds great. I love pumpkin in dishes and I’m not surprised by porcini mushroom sauce in the tart. Everywhere we went in Emilia-Romagana, mushrooms and truffles were served in numerous ways. I went there not knowing anything about the local food, so I was glad for Hotel Touring’s recommendations. Always ask the locals!